About 300 people joined a protest on Saturday against a luxury development in Cornwall. 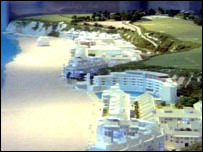 Objectors to the scheme claim Ampersand, the development company behind the apartment complex at Carlyon Bay, are "forging ahead" with work. Deputy Prime Minister John Prescott is considering whether to hold a public inquiry into the scheme. Ampersand's Jonny Sandelson insisted the company was only working on areas which they have permission for. Local residents have expressed concern that the company has closed Crinnis beach to start work preparing the site. One local resident Sara Barratt is worried that the company is ignoring their concerns. She said: "In the last few weeks I think locals have become very resentful of the fact that they can't get down on to the beach they have used for leisure and recreation purposes for the last 50 years because of this action by a private company." But Mr Sandelson says there is no need for an inquiry. "It's very difficult to see why there would be one, it's not of national importance, there are no overwhelming local issues. "We're proceeding to meet our targets and our deadlines."